Deleting multiple Terminal Server user profile temp and temporary internet files out automatically. A while back I found a very useful little app that was developed purely to clean out or delete user profile temp and temporary internet files from TS profiles for all users. icsweep /tmp for only Temp files. Just for interest sake, I cleared two terminal servers earlier using the /all switch and gained 40GB of free space between the two of them! Cannot save the attachment. Can’t create file in Outlook. Had this problem on a PC today – Outlook was having trouble opening .MHT file attachments from a contact item. Any attempt to open any .MHT file would result in an error message stating “Cannot save the attachment xxxxxxxxx.mht. Can’t create the file. It then asked to open the folder / file in question and check security permissions. This could happen for any attachment type, but in my case it was .MHTs. Anyway the quick solution I found is to browse to the “OutlookSecureTempFolder” and remove all files listed in that directory. Close and restart Outlook and everything should be working again. Credit to this page where I found the solution. 1. Open REGEDIT.EXE and go to Edit -> Find… In the Find dialog box type “OutlookSecureTempFolder” without the quotes and locate that registry key. 4. Click on Start -> Run… and paste the folder location from step #4 then click OK. 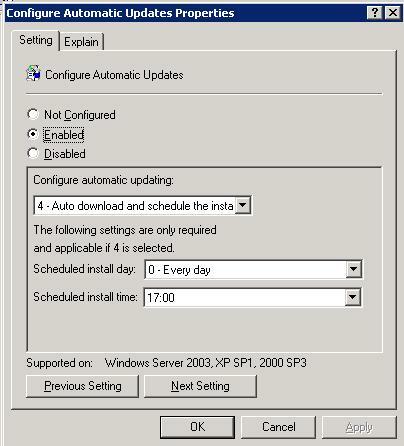 This is a quick how-to for setting automatic updates using group policies in Windows Server 2003. Start off by opening up Active Directory Users and Computers from the server. Hopefully you have got a specific OU that you want to apply this group policy to. In my case, there are about 100 computers listed under the Computers OU in Active Directory. My servers are located in a different OU, which is just as well, because I don’t want this policy to apply to the servers. 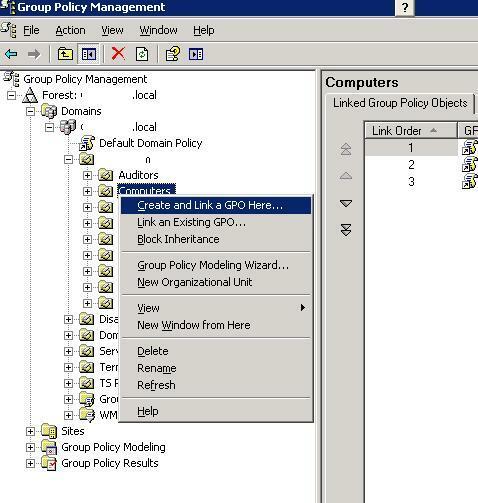 Right click on the OU you want to apply the Group policy to, and select Properties. From this properties page, select the Group Policy tab. 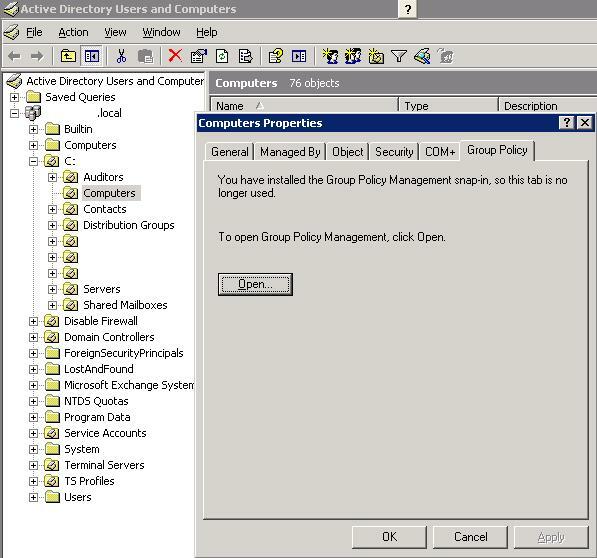 If you already have the Group policy managment snap-in installed, you will see something similar to the screenshot below – in this case just click “Open” to continue. Now the Group Policy Object Editor will open. 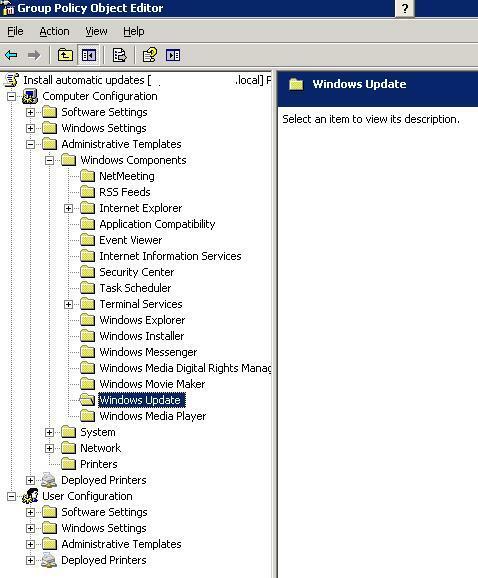 Under Computer Configuration, expand Administrative Templates, then Windows Components, then Windows Update. 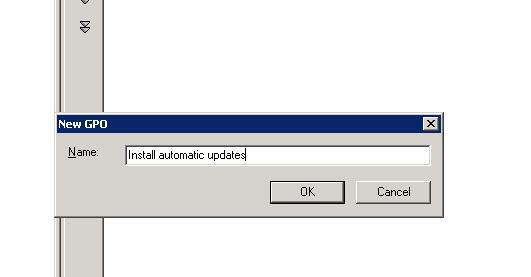 On the right panel, right-click “Configure Automatic Updates” and select “Properties” Set the status to “Enabled” and choose your automatic update setting – I used option 4, which will download and install updates on a schedule, which I set to 17h00 every day. You can optionally set the settings for the option “Delay restart for scheduled installations” otherwise the PCs will be given a count down timer of 5 minutes once updates are installed to auto restart. The user can delay this if they are logged in, otherwise configure this setting to set the count down timer up to a maximum of 30 minutes. The user can always click restart later anyway. 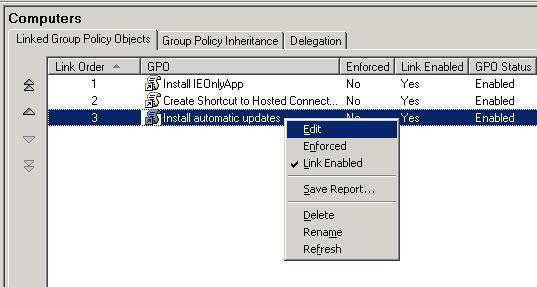 Close the policy editor, and group policy management down once you have set your various options for automatic updates. The GPO will now be linked to the OU “Computers” and any PC listed in this OU will have this policy applied the next time they login, or group policies are applied. Hope this helps anyone looking to achieve a similar result!